Just as we’ve designed the UBA5 to be a versitile and flexible piece of test equipment for engineers, we realize that for the production environment, you want it to have custom fixed setups that you can program it with. For example, in this setup the operator can choose from one of three selections that you’ve programmed for this battery, i.e. 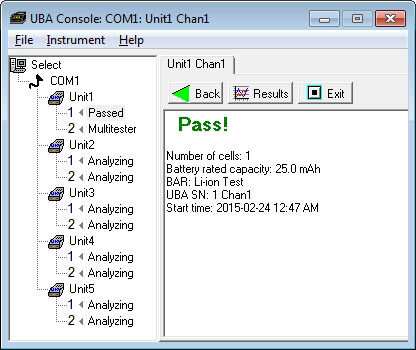 Form, Quick Test, and Full Test, or open a multitester to just check the battery voltage. 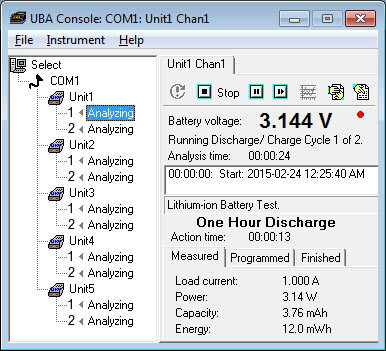 The operator can click on any of the running channels to monitor the analysis. All these customizations can be programmed and then the software can be locked down on the production floor so the operator cannot change any of the settings.